JOHN Stephenson, father to two sons (one of whom is deceased) and grandfather to four, has achieved something he thought he never would. 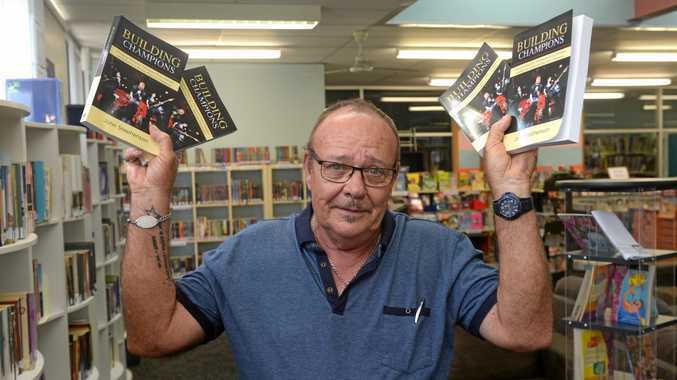 After 10 years in the making, the 67-year-old Gracemere man has finally finished writing his debut book, released earlier this year, Building Champions: Changing Disruptive, Delinquent Teens' Attitudes and Behaviours to Become Real-Life Champions. 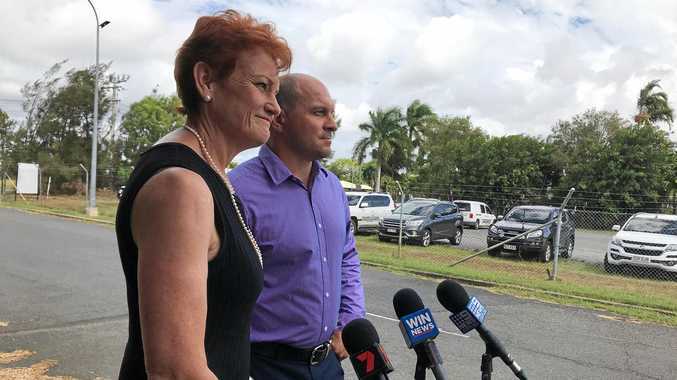 Building Champions is set in an industrial township on the east coast of Northern Australia and follows the story of a determined mentor, Rocky Scott, who helps a group of troubled teens from the wrong side of the tracks to change their attitudes and behaviours and become real-life champions. It was published by iUniverse on January 26, 2019. 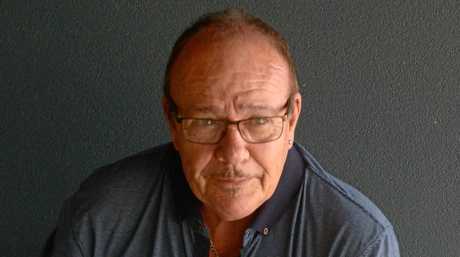 Mr Stephenson, who works as a facilities officer at Glenmore State High School and is now a published author, said about 80 per cent of the fictional novel is based on his real-life experiences and interactions with teenage boys over the years, "just dramatised a little to make it more interesting". "In the late '90s, I used to drive a maxi-taxi Friday and Saturday nights and young people would go from party to party," he said. "The teenagers were the most challenging but there was a group of 12 that were constantly together. They were smashing things, acting violently, taking drugs, drinking - stuff 15-year-olds probably shouldn't be doing. "But when I had one or two of them in the taxi, I found I could talk to them sensibly and have a conversation with them. It was probably because they trusted me, that's what this whole thing is about, trust. "From there the group managed to come around, they wanted to listen, and they wanted to try new things to get a better life because they were sick and tired of being told they were useless. "The story tells how they made a success of themselves and the many obstacles they faced along the way." He said he based the book on his own experiences because it was what he knew. "I had no guidance, no one to tell me how to do it," he said. "I just decided to do it and when I finished it in May last year I didn't know what to do with it - here it is. "It's funny, the publishers told me my writing was so different to anything they had ever seen. They asked me what books I had read to get my influence from and I told them I hadn't read a book since 1968." Mr Stephenson said he was inspired to help disruptive and delinquent teenagers after the numerous interactions he had with them over the years. "I have had hundreds of kids over those years come to me for someone to talk to - people put them down and call them useless," he said. "I am not trained, I am not a psychologist, I just have a knack for communicating with young guys on their level and the story tells how that came to be. "To this day kids still come to me with their major fears, thoughts, concerns, and issues. They come to me when someone has hurt them or called them a name and I show them there are other ways of looking at the issue, to solve their problems or challenges, and to make them feel better about themselves. "They also tell you some private stuff, some of the horrible things that have happened to them because they trust me. Over a 30-year-old period, it's all been about trust. "It annoys me how some people can put kids down or have no time for them. Kids just need someone they can trust and help them along life's pathway." At age 40, Mr Stephenson suffered a serious illness that nearly took his life. This is also described in the book, with the main character suffering from the same illness. "I suffered Stevens-Johnson syndrome, which is a type of severe skin reaction to medication. I was one of the first survivors," he said. "For some reason, suddenly, I was allergic to penicillin. I'd had penicillin before. "In the early stages I had flu- like symptoms, so I went to the doctor because I thought I had the flu and was given penicillin and antibiotics - I only got worse. As it turned out, I had Ross River virus, Barmah Forest and Epstein Barr virus, which led to glandular fever. "I went back to the doctor and they changed my medication to a different penicillin-based antibiotic. "Within 24 hours I had all these blisters, like bunches of grapes, coming out of my body - and they went all the way through my body as well." Luckily for Mr Stephenson, his doctor had studied tropical diseases and had a colleague in the US who could help. 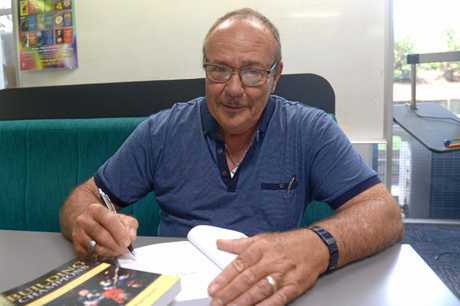 "There was a disease called Pemphigus vulgaris (a rare autoimmune disease characterised by painful blisters and erosions on the skin and in the mouth) and the treatment for that was steroids - it was said to cure up in a couple of days," he said. "My blisters were on the inside of my body, the doctor from the United States told my doctor not to give me steroids until he could see blisters on the outside of my body - they never appeared on the outside. I ended up having to go to hospital. "On the Saturday, I remember I was on the football field at one of the kids' games and I couldn't breathe, I just started to choke - those blisters went everywhere. "On the Monday, it was that hard to breathe, I had to force myself, it was that painful. So, I gave up and wilfully stopped breathing." Mr Stephenson said as he died he went into a state of "nothingness". That was until he described seeing a beam of light. "On one end was my two kids and the other end was a male figure dressed in white," he said. "My kids were pulling me back and the man was telling me to go back, he said there are kids out there that need you, you have to go back. "To this day, I don't know if I decided to go back. "When I came to, I was leaning over the side of the bed with all this stuff coming out of my mouth and I was alive. I have a crook shoulder from it, but I don't hold it against any of the nurses or doctors because I got 28 more years. "After that I was in a coma for a fortnight and when I came to I was attached to all these feeding tubes. "I had lost my memory due to a lack of oxygen. I had no memory from when I was born to when I woke up. "It's coming back to me now, but it's a discovery. "Anyway, I survived and had to get myself back to health." After the ordeal, Mr Stephenson's doctor told him some news that was hard for him to hear: he couldn't work any more. "My doctor told me to collect my superannuation because I would never work again," he said. "I thought to myself, no one can tell me I can't work. I'm not going to just sit around waiting to die. No future in that. So, I got back into the workforce and am still working to this day." Mr Stephenson said his near-death experience didn't necessarily inspire or lead him to help teenagers. He said that was something he was already doing and not something he was going to stop. "I never really stopped. I just continued helping where I could on a much smaller scale because I didn't have any energy," he said. "There was a two-year period where I didn't do much after the illness. "During 1995 and 1996, I would assist teachers at school camps and school-based practical assistance programs with teenage boys. I started to get back into it there." 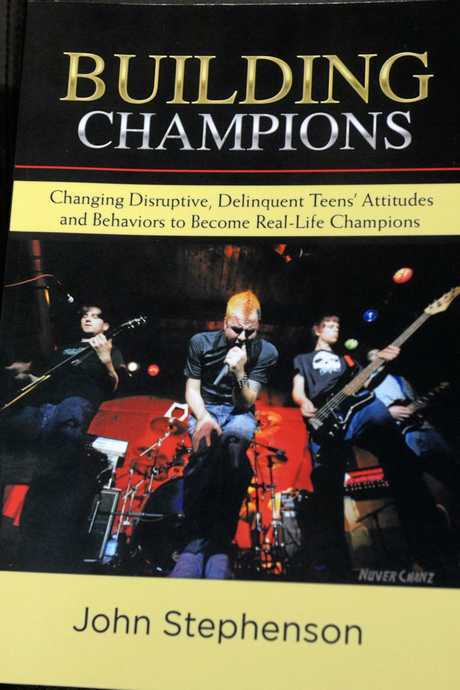 Mr Stephenson said, ultimately, he wrote Building Champions because he was annoyed at people 'rubbishing teenagers'. "At the start of the book it says when I see a group of teenage boys in a shopping centre, and adults would walk around them in fear," he said. "I don't know what was wrong with people, but I walked up to the group and said, "How ya doing, fellas?". The look on their faces, like they were thinking, 'this one talks'. "Long story short, I had messages and things I thought both kids and adults needed to know. "The things kids do is normal, and both kids and parents need to know that. All kids do the same thing, they're not bad. "If they want to strip their clothes off and go and swim in a creek that's not bad. Skateboarding and the way they wear their clothes with their pants down low, that's not bad. He said the main message he wanted people to take from reading his book was for parents to talk to their kids and kids to find someone they can talk to. "I would like for parents to spend more time with their kids and talk to them," he said. "Some kids can't talk to their parents about certain things, they need to find someone they can trust. The most important thing is trust. "The book also has messages around creating a future, goal setting and moving away from drugs, alcohol and violence, as well as sexual education. "I hope it get kids interested in sport and music, have some activity that occupiers their mind, build friendships and educates them." Building Champions is dedicated to Mr Stephenson's son, Danny, who has since passed away. The dedication reads: For my family and in memory of Danny, my eldest son, a great guy and amazing rugby league player, coach, and administrator. Mr Stephenson said this is only the beginning of his career as an author. "I had planned to write three books and make this a trilogy," he said. "I wrote this book back in 2008, except for three or four chapters and the ending. "The reason for that is I had a massive heart attack and six bypasses during that year and on New Year's Eve my son died, so I put it away. "Last year around May I thought I had better finish this thing before I die, because I am 67 now. "It was hard to write a couple of those final chapters because of what had happened. "I am going to write two more books following the story from Building Champions and I am also going to write the story of my son's death." He said his advice to aspiring authors is to "just do it". "Make the decision to do it," he said. "I just picked a date, sat down and started writing. Once you get in the zone it just flows. "For me, I wrote about things I had experienced. You have just got to find a starting point and go with it." Building Champions can be purchased from iUniverse for US$20.99, or Amazon Australia. It is now at book distributors in Australia, and hopefully, on book store shelves soon.